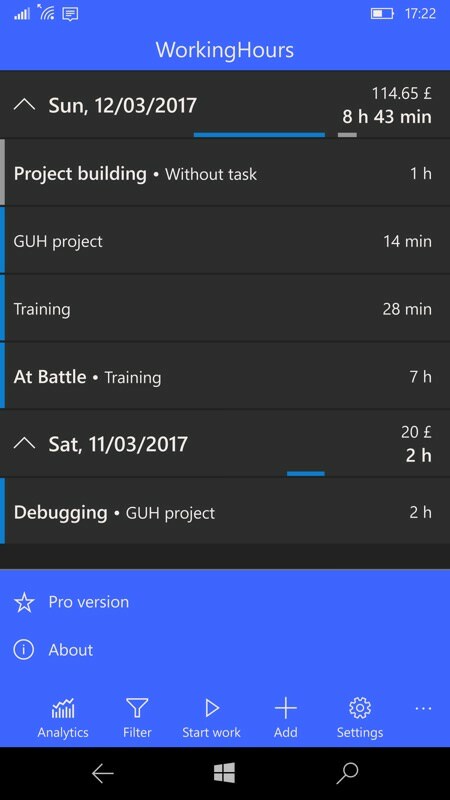 Shown here are screens of WorkingHours UWP on the Lumia 950 XL, and with virtual controls shown, though it works equally well whatever W10M device and configuration is used. The developer, the prolific 'T. 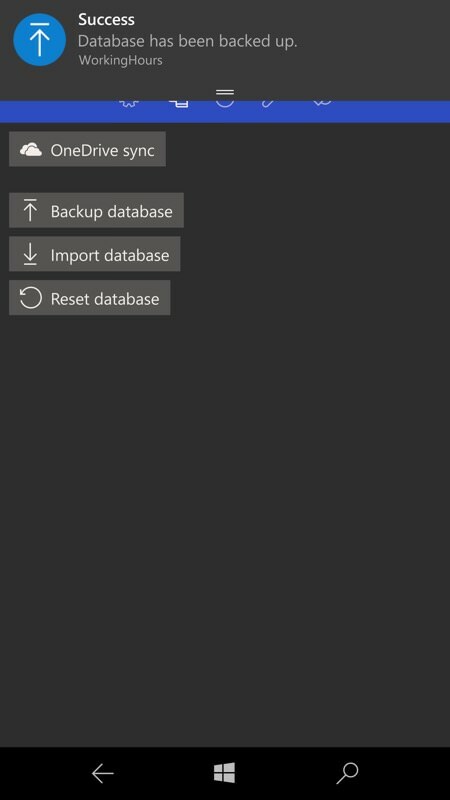 Partl' has released the application for free with all the backup and export functions unlockable through going 'Pro' (as I did here). 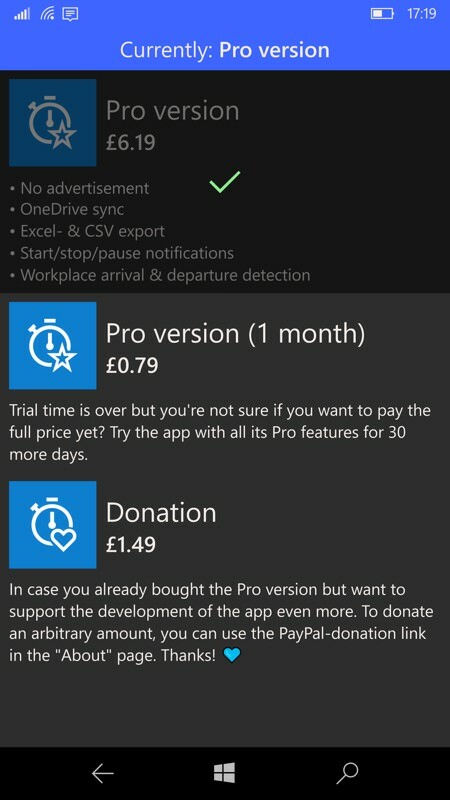 If you're still not sure about the basic features then, as shown above, you can go 'Pro' for a month for a nominal $1 - which should get you hooked. 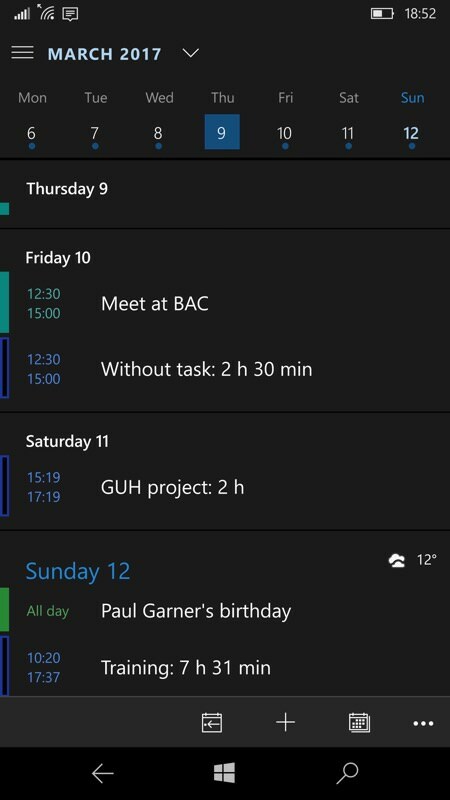 Your logged time and projects are all listed in the main view chronologically and, unusually for a UWP/Windows 10 app, there's no hamburger menu. Instead, everything's controlled and filtered from the bottom of screen controls and filters. 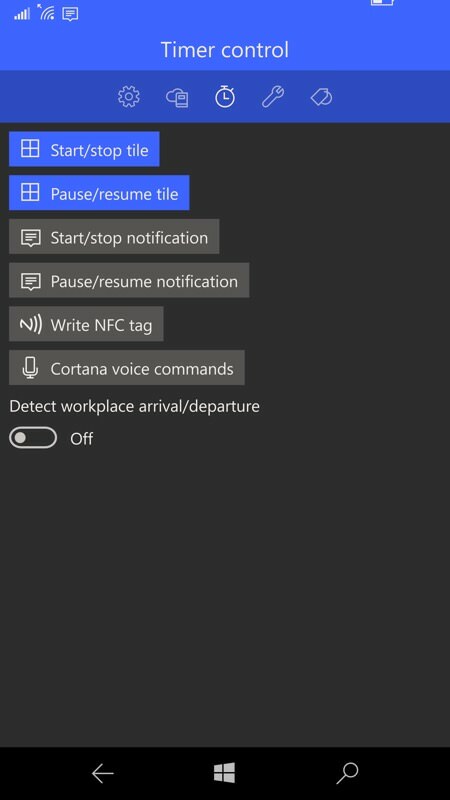 In fact, many of the functions are embedded in Settings - again unusually, yet somehow it all works. 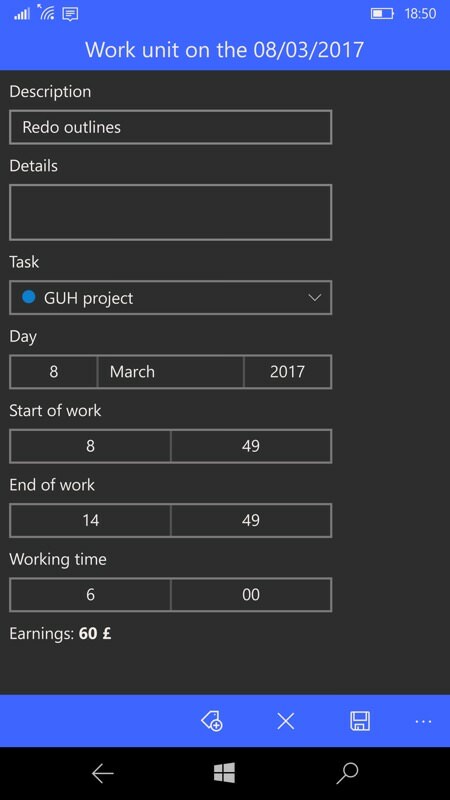 There are two ways to log blocks of time. Either by entering them manually (often after the event, or if you're adjusting something) or, more excitingly, by tapping the play control and picking a project from the pop-up list. In practice, once you've got your main clients and projects all in the system, this is very workable and won't need any amending later on. Play to start a period of work and (pause or) stop to err... stop it and save it. 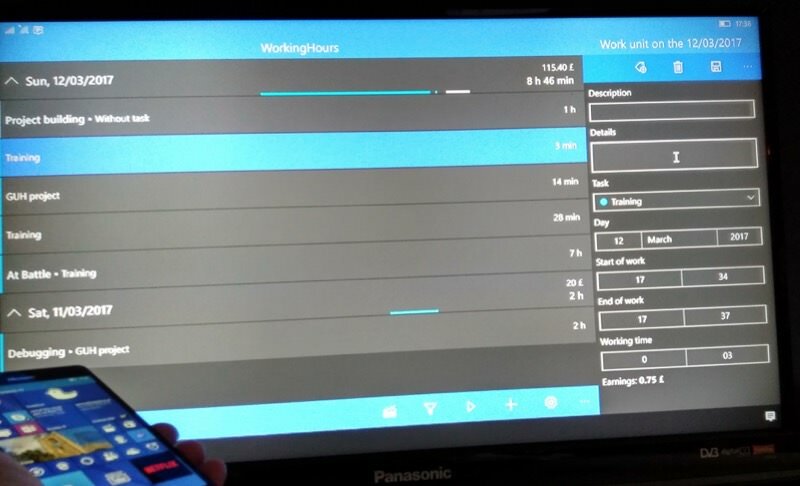 So you're a month into your work logging and it's time to get your data out of WorkingHours - there are loads of options here. 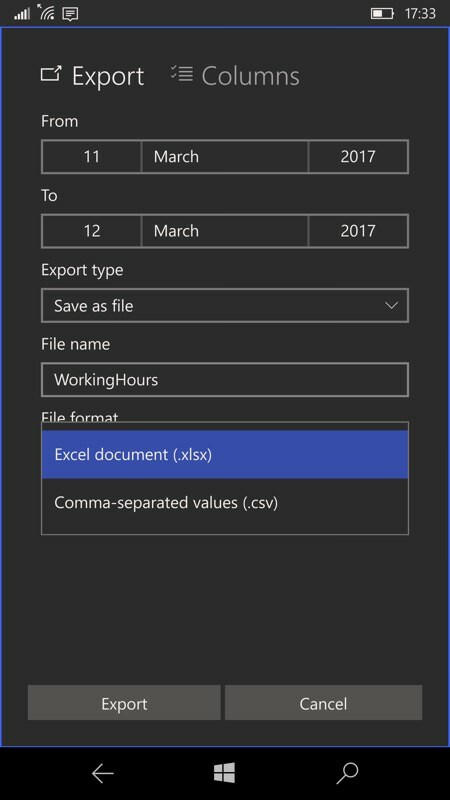 As shown below, you can export directly to Excel or CSV formats, which should cater for just about any accounting system, plus you can sync through OneDrive to WorkingHours on a Windows 10 laptop (for example) or simply back up your WorkingHours database (or indeed restore it, should your devices have got out of sync or if you're recovering after a device problem). 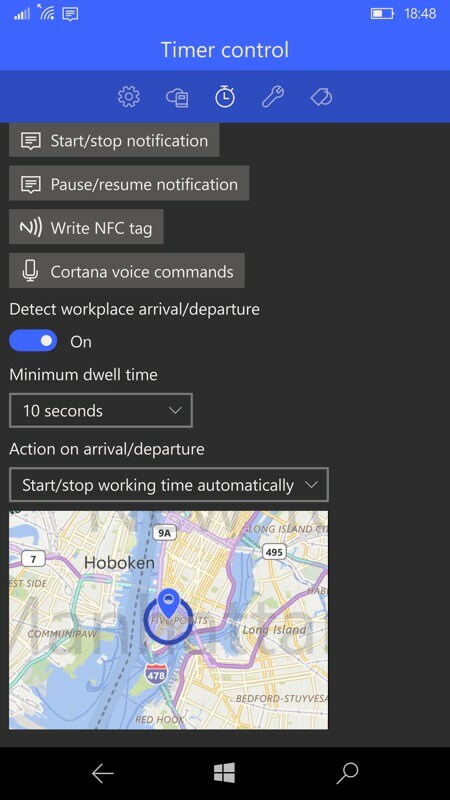 One of the other 'advanced' features that get unlocked after going 'Pro' is being able to specifiy a geofence for your work location - 'untasked' work can then be auto-logged once you get within the geofence. 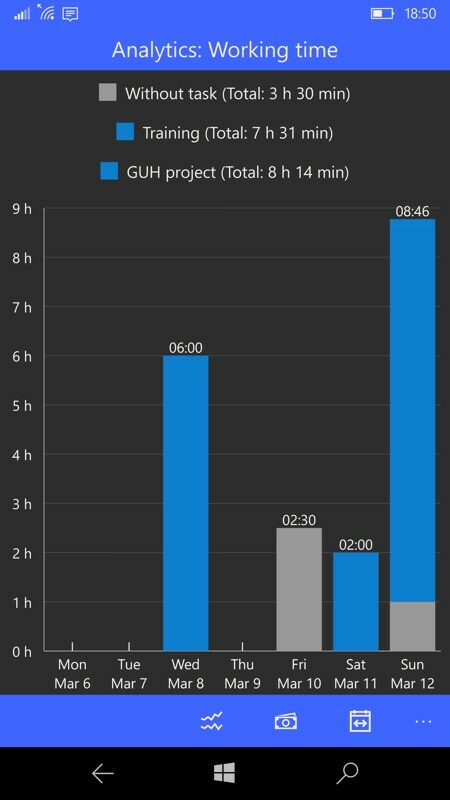 This won't help you with client-logged time, but it will give you a better sense for how much time you spend at work and these hours will be logged automatically. Maybe. 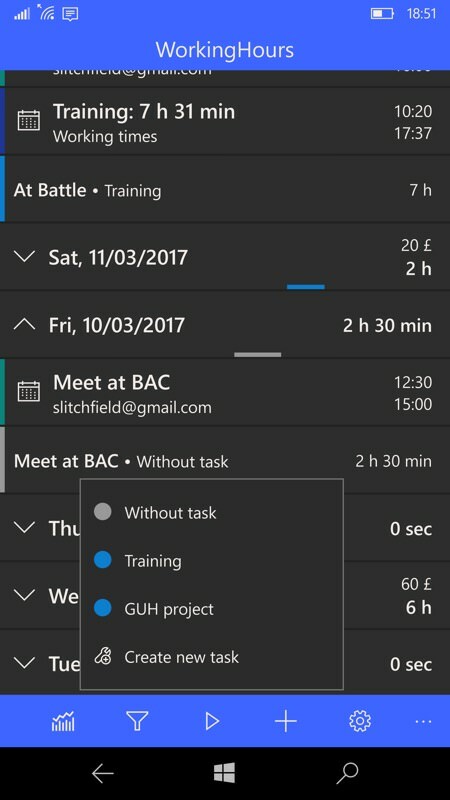 One of the other interesting features is Calendar integration - WorkingHours logged time gets echoed in Outlook (below, right) and Outlook events get displayed in WorkingHours, from where a simple tap can convert them into a billable work unit, as shown below, left. 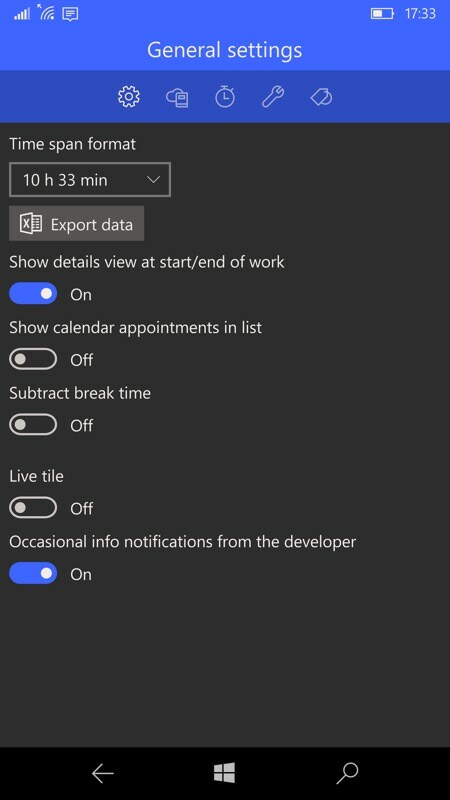 In addition to a standard Windows live tile, on which you can choose which data stat to display, there are controls to pin start/stop and pause/resume live tiles as well, giving you one less tap to get straight into time logging action. In practice, the 'resume' one didn't work properly for me, but I'll chalk this down to a bug which will soon be fixed! 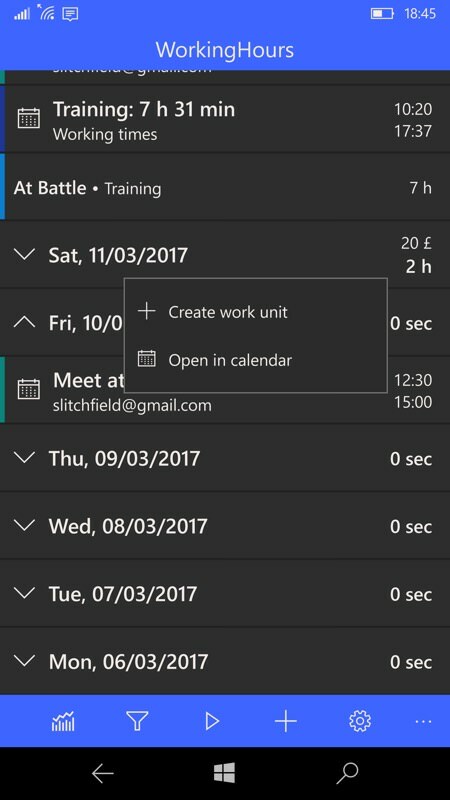 If all this seems a bit over the top then WorkingHours probably isn't for you. However, I have direct experience of working in a multi-client operation in my past - I even wrote my own application (on the Nokia Communicator! ), so desperate was I for this functionality. 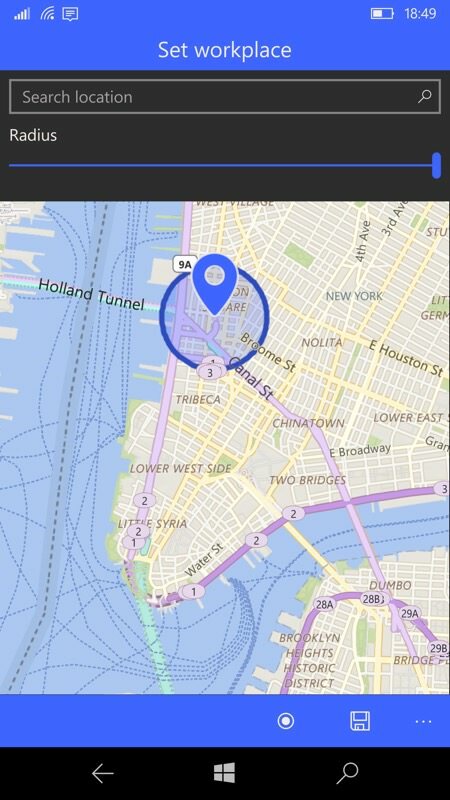 Any company where you're a resource that needs to be tracked or as (in my case) a self-employed programmer, are use cases where WorkingHours will fit right in. 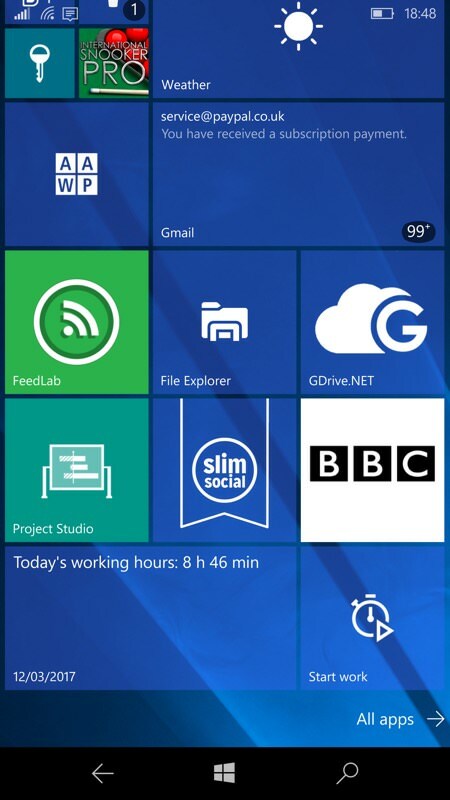 And, for once, given the Microsoft-centric nature of many offices, the use of a Windows 10 UWP app is perfect!